For three weeks now, I have first been spraying and scraping the "popcorn" off of our hallway/living room ceilings. Then there was some necessary ceiling repairs, and much cleaning! We were supposed to texture the ceilings this Saturday, but five out of five of us ended up sick with a cold this weekend! So, it will have to be next Saturday instead...but you know what? It means this week will be a little less busy because I can't paint anything until we texture. So I have been taking a little time out. It looks so happy paired up with these flowers I had bought the day before. 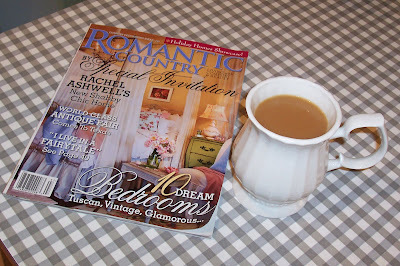 Nothing better than sipping a cold or hot drink and browsing a magazine when you are not feeling quite up to par. I know it is better than scraping ceilings...YUCK! You found some great items at the garage sale. Lexi will occasionally go with me to some. Usually I am by myself. 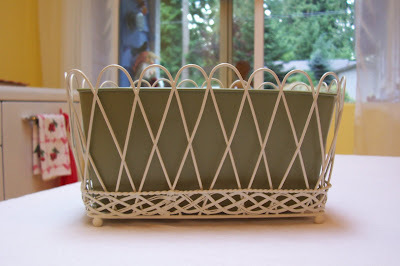 Oh, I just love that wire basket! 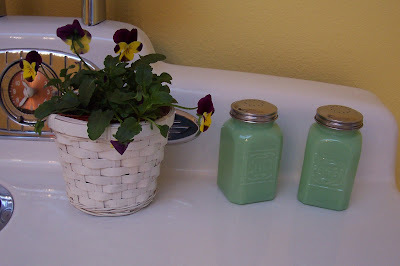 I am searching for something similar for my master bathroom. Hope the cold goes away soon. I know everyone here at work is sniffling and sneezing. I'm glad you got a time out! I love magazines so much! Great yard sale finds. I love the salt and pepper shakers. I hope your family get well soon. I have a sick one home today. Wow, I love the spooky craft! What a great job you did on it. I'm going to have to come back and see what else you got going on. 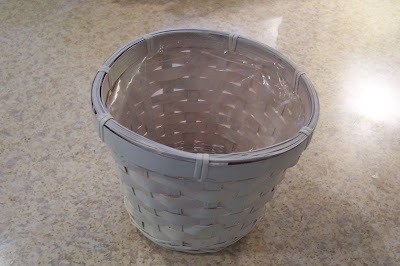 I love finding idea's like this as I work with adults with disabilities and do crafts with them occasionally and need new ideas. Just what I need...a time out. A time out sounds very refreshing right about now. :o) I hope that you have enjoyed your time of rest! My husband and I came here from Spokane 4 years ago. We had a house we spent 10 years fixing up in Spokane. When we moved here we bought a new house. I like this house but there is something really special and "homey" about a fixer upper. 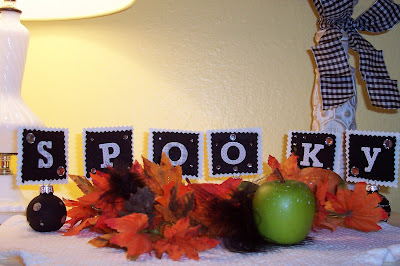 I love your fall decor~! I think that I have found a kindred spirit. 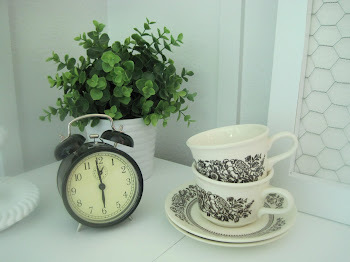 Don't know exactly how I found your blog, but I LOVE it! 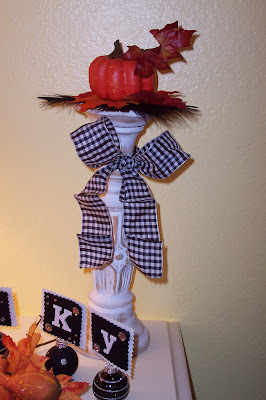 Your fall decor is so cute! I love the "spooky" thing you did. All your pictures are so pretty! 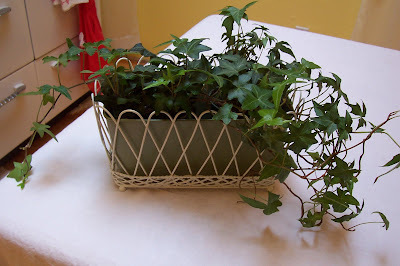 I love ivy. 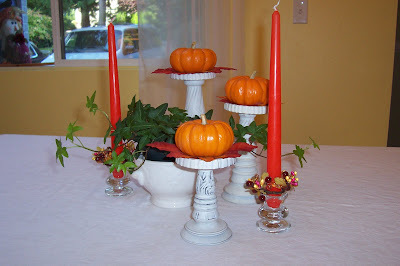 And your pumpkin candlesticks look great!